Is this so-called dragon used to exist in the physical world, why did it leave? Jackie Paper came no more! From what I have worked out so far it seems to have a lifecycle of either 15,000 or 30,000 years. We seem to be in the gestation period at the moment, when its physical presence is not visible. If the biblical prophesies are correct then we can expect a new hatching some time soon. If this is so, things could get interesting. Soapy: Now he is just messing with you, in a very Borat sort of way. Over the years, I have heard a lot of people cramming a lot of prophecies in that particular book. Even when they were found to be consistently wrong. "A new hatching some time soon"? I'm mildly intrigued, buzz lightyear: Which particular part of the bible prophesies this? And, please, feel free to clarify where needed. Hey Gzuz, nice to hear from you. Any comments on my cute pics? I particularly like the vertical strata one. I can't wait for Tricky to spout some wisdom on it. Anyway the prophesy thing is covered in chapters 12 and 13 of the Book of Revelation. There is also a neat bit in capter 9, verses 7 to 11. But my reasoning on the "hatching" comes more from the fact that the egg case, next door to the one that I chant in, is starting to open. Buzz on the last 3 pics- Top one I can't make out any detail on. Middle one ditto. The horizontal surface I take to be artificial. The big one clearly shows , as you say, steeply dipping layers which I assume are bedding planes (but that is not necessarily so). You say there is no folding, which is a very strange thing to say as your photo very clearly shows there is. 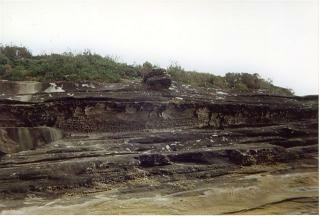 Sediments start horizontal and get vertical through the process of being folded. If the older beds below them are horizontal, there are several possibilities. 1.The upper beds have been pushed up over the lower ones which form a stable block. This can happen through shallow angle faulting ("thrust faulting"). The Moine thrust in NW Scotland is a good example. 2. The lower beds may well have started horizontal, been distorted during folding and ended up horizontal again- though it's possible they are now inverted. Mountain ranges like the Alps are full of such structures- often on very large scales- miles across. I'd be interested to see the contact between the steep dipping rock and the underlying horizontal stuff. Always bear in mind that tectonic structures are big- sometimes hundreds of miles across and miles thick. Rock is brittle at high shear rates- hit it with a hammer and it shatters, but at extremely low shear rates (millimetres per century) , at elevated temperature and in the presence of small amounts of intergrain water, rocks flow. Depending on their initial mechanical properties, they can behave like warm toffee or boiling syrup. Look at this- Which way would you say is "up" in this rock? Which way would you say it was when the rock formed? Last edited by Soapy Sam; 8th April 2007 at 03:18 PM. That guy is clearly amazed by the fossil snake ahead of him! Its black with white stripes, and its swollen belly indicates it ate something! Is that you standing in front of that convoluted piece of rock, Soapy Sam? The rock sure has had a bit of work done on it. Where is it ? Somewhere in the Alps? I attatch a longer shot of the "vertical strata" site. The area in question is about where the white sign is. Also here is a cross section of the general area. There is no sign of folds. The area in the pic is the intersection of the Narrabeen and Hawkesbury formations. I will have to look through my books and see it there are any intrusions or faults in this area. Now, I am neither a biologist, nor geologist, which you must admit makes me uniquely qualified to comment on this thread. I am now about to disqualify myself, by pointing out that I do have some powers of observation and recollection. Whaenever I have looked at animals, with scales (usually fish on a plate) I have noticed that the scales are pretty flat, they do not look solid as in your pictures. The scales are also roughly the same size in the same area of the fish. There is not such a random distribution of sizes as in your pictures. What caused the Giant's causway and Fingal's Cave on staffa? No comments necessary on your pics. You have made up your mind already, haven't you? Revelation, 9; 7-11: Locusts looking like horses. Women's hair, lion's teeth, stings of scorpions, Abaddon, Apollyon? What does this have to do with dragons? Or do I simply have to chew "some" belladonna to "understand" this? New life falls from the oppressed." "Postmortem", from the album "Reign In Blood". The Giants Causeway and Fingal are colums of Basalt, a rock of volcanic origin, jimbob. Whereas these formations are called "sandstone", which is believed to be a sedimentary rock. The original shape of the "scales" may have been different on the creature. When a snake sloths a skin, it looks very different to when it is on the animal. As for uniformity, these are pretty similar. And if you want to tell me that they are "mud cracks", explain how mud cracks vertically down hill as in this pic. Yes, I also claim the same credentials as jimbob. (I don't remember seeing him on campus, though.) Anyway, I have seen shed snakeskin and it looks nothing like your rocks. It looks like embossed tissue paper and hardly ever turns to rock. I could be wrong, though, as you may have discovered that flying dragons with Swiss Army knife appendages could shed rocks instead of scales. By drying out? Are cracks in mud two-dimensional (or should I say dementional) where you live? Yes, Buzz, that is me in the photo. Sadly it's at least 15 years ago. The photo is taken near the bottom of the Grand Canyon. 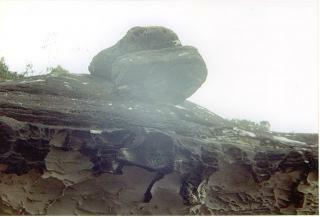 The rock is named the Vishnu Schist, which Correa Neto correctly terms a "migmatite", or "fubarite" to use a USGS field term. Going back to your question about the vertical strata- It certainly looks like vertical bedding in the earlier picture with the sign in the foreground- that's why I said it looked folded to me. The later, more distant shot makes it clear we're looking at a cliff. I can't tell from the pic (ya gotta BE there! ), but the first question I ask when I see a cliff is - Why is it there? 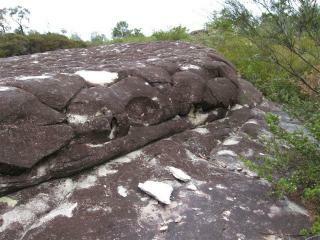 Second picture down shows what looks like fault drag in road cuts in the Hawkesbury Sandstone. You can actually see bedding dragged to a steep angle just above the blue car. The fault plane is easily seen. I presume these relate to post Trias uplift. gives a far better illustration of the sort of channel cross bedding I attempted to illustrate. 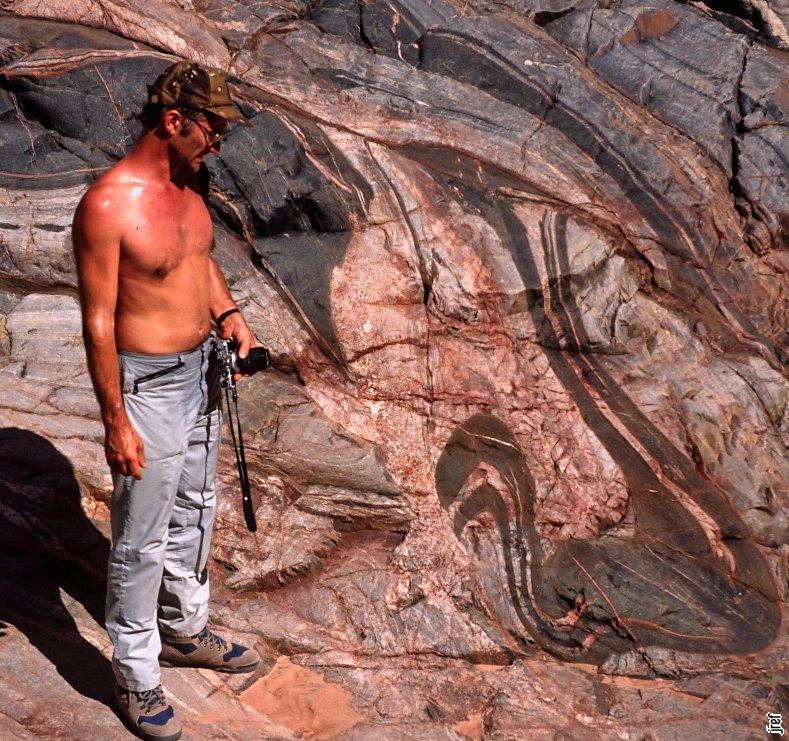 It also appears to show the "lens"or "scone"structures you are calling scales, which here clearly show internal cross bedding, typical of braided channels. This clearly is a sub-aerial river sandstone. Shrinkage cracks would be expected, especially if there are interbedded shales as both these sites mention. I still think these are the finest examples of fossil shrinkage cracks I've ever seen, but I truly think that's all they are. One point- The sandstone is evidently light coloured on fresh surfaces. The dark red colour on weathered surfaces may be iron oxidation. There seems to be a lot of iron carbonate in it. 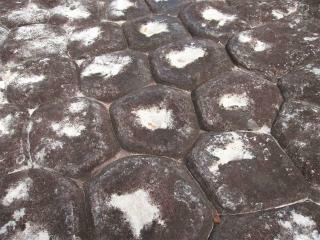 I think the weathering of the cross bed set / polygons gives a very confusing aspect to eroded surfaces. Fascinating as they appear, they don't tell you much. Fresh cross sections really give a far clearer picture. I again advise you to visit some road cuts and see what you think. Last edited by Soapy Sam; 9th April 2007 at 09:05 PM. Thanks for the comments Soapy Sam. And don't lament about the passing years, men, like good wine, improve as they age. 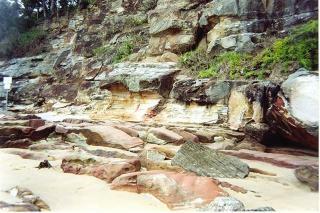 The cliff question also occured to Charles Darwin when he visited the sandstone country to the West of Sydney. He remarked, that what he saw should be costal cliffs, but they were 50 miles inland. I found a couple of pics of the area of the "vertical strata".If there is a fault line it shoud be in this area. In the first one, the white sign that I spoke of, is at the far left of the pic. 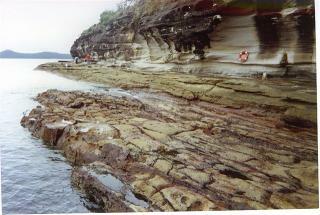 The second is the rock shelf further along past the swimming pool. Am heading back down this way in a month or so and will study the road cuttings more. I have pics of a couple of other "abnormalities", will see if I can find them. I still think these are the finest examples of fossil shrinkage cracks I've ever seen, but I truly think that's all they are. Been chewing over your replys, Soapy Sam and this statement is the one that caught my attention the most. 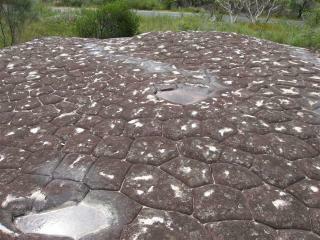 Have you seen examples of fossilised shrinkage cracks? And do you have pics of them? The only pics I have seen that look remotely similar are these formations in the dry valleys of Antartica. Do you know how they originated? Why do you accept that some natural processes produce poplycons, and that vulcanism prduces some rocks annd not sedimentation? I bet there were myths explaining the origins of the giant's causway (probably involving giants). Wasn't it created by giants then? Its good to find someone who's spelling is as rough as mine, jimbob. The joints between the polygons produced by the cooling or cracking of rock are usually free of solidifed sediments as shoud be the case if they havn't been buried. The joints in the sandstone polygongs should show some residual material that had settled in the cracks. They are supposed to have been buried by sufficient material to cause them to harden into rock. And if you happen to look at this thread Soapy Sam, here is another "abnormality" just around the corner from the "vertical strata". This lump of sandstone is fused to the cliff on which it sits. Not just resting there, but part of it. Pics are not the best.